Postcards from Scientists – Was Expedition 369 more “Ernold Same” or “Master and Commander”? How does one sum up two months on the JOIDES Resolution? A song, a painting or maybe a poem? How about a lightly amusing blog? Let’s give it a try! 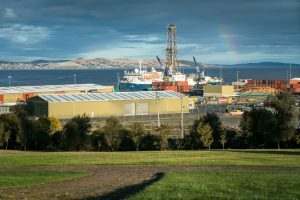 A good place to start reminiscing on my adventures on the high seas was when I first arrived in Hobart, Tasmania on September 26th and saw the imposing JOIDES Resolution berthed in the docks from the taxi window. The only thing larger than the JR in the city was Mount Wellington and that is a mountain over 1000 m tall. Up until that point, the reality of sailing for two months and working 12 hour days had not truly sunk in as I was busy finishing off my PhD until a few weeks before departure. Before I had time to think about serious expedition matters upon my arrival in Hobart, I bumped into a rather bubbly American with a crate of beer on his shoulder in the hotel lift who was clearly very delighted about something. He left a notable impression on me for the remainder of the afternoon. 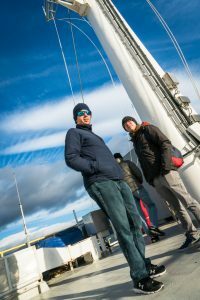 Little did I know that he was a co-chief on Expedition 371 and that evening during an IODP event in the harbor, what he and others on the JR had found during previous two months at sea was significant enough to attract the attention of the world’s media (aka. the lost underwater continent of Zealandia). Maybe a similar fate awaited Expedition 369? Big science aside, my biggest unease at the beginning of the cruise was not having been out on the open ocean for more than eight hours. It was certainly an odd feeling that I would undertake important research in a very confined space and be out of sight of terra firma for the best part of two months. In retrospect, it was not that bad considering there is plenty to keep one occupied on the ship although when the seas were rough, I did think about making a quick getaway to somewhere more sunny and tranquil. At times, it was difficult adapting to life on board both on a scientific and personal level. My Mum likes to think that I am living an adventure like Captain Jack Aubrey in Master and Commander (and in many ways it was, especially the part when his friend who is the ship’s surgeon gathers scientific specimens in the Galapagos Islands). However, some days I felt more like Ernold Same in the song of the same name by Blur about a rather dull character with a repetitive routine. A few people will probably tell me off for using that analogy in the years to come. On a more serious note, what I most enjoyed during the cruise was coring at Site U1515 off Western Australia. From shipboard data, no one on the ship was sure what we might encounter. When rock resembling ancient swamps began to arrive, my training during my PhD began to bear fruit when I could identify potential dinosaur footprints in core (sorry, no T-Rexes, probably more velociraptor) and put a crude estimate on the age of the rocks we were encountering. This gave everyone onboard some initial insight on ancient plate tectonics when India began to break away from Australia at this locality. Believe it or not, Calcutta was next to Perth back in the day! One thing I wished to do was whilst I was on the JR was to get involved in outreach as many scientists forget how important it is to communicate their findings to their peers and the public. Writing blogs, being involved in a film about life onboard, engaging the public on what key scientific questions the JR is trying to answer, and being put to test by inquisitive schoolchildren definitely helped lift my morale during the day shift (especially when the weather or drilling problems slowed down data collection to a crawl). 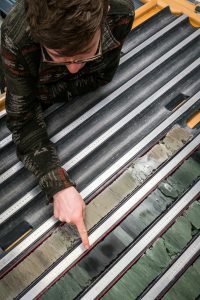 Towards the end of the cruise, I began to realize how unusual Expedition 369 has been by seeking answers on both the tectonics and climate of Australia during the Cretaceous – usually most IODP cruises focus on one or the other. We also broke a few records notably for the best (and the worst) recovery of core on the JR using a rotary core bit (RCB). 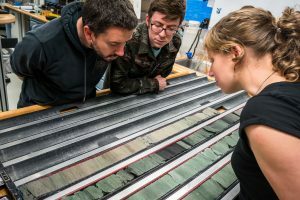 Finally, we encountered native copper and ancient terrestrial rocks below the seafloor – most expeditions tend to collect rather monotonous marine oozes from major events that are relatively recent in Earth’s history. The most rewarding outcome of being on the cruise is that the results of Expedition 369 collected by myself and others scientists will be felt for the years to come and bring new insight on this part of the world 100 million years ago. On reflection, it was definitely more Master and Commander than Ernold Same!